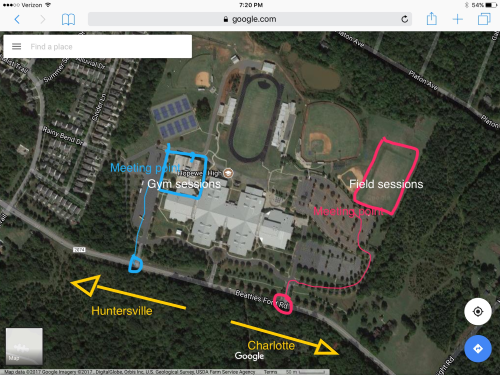 The Huntersville Summer Academy sessions at Hopewell High School will have aspecific entry point to the training field. Please make sure to enter and make the loop as indicated in the picture(Click on picture for clearer view) of the school. If coming from Mt. Holly Huntersville Road towards the school, the entrance will be the first one you come to on the right hand side. If coming from Highway 73 towards the school, it will be the last entrance to the left. You will make a little bit of a loop to get to the drop off point at the field.